Sea surface temperature anomalies are well above 8°C (14.4°F) in several parts of the Arctic Ocean. The image on the right shows sea surface temperature anomalies from 1961-1990 for the Arctic (60°N - 90°N) on August 2, 2017. 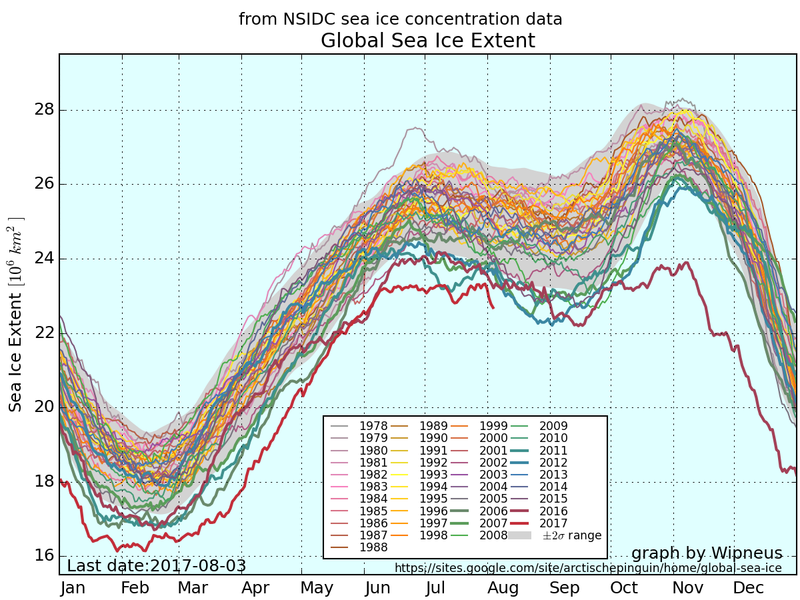 Global sea ice extent is at a record low for the time of the year, as illustrated by the graph below, by Wipneus. Lower sea ice extent means that less sunlight is reflected back into space. 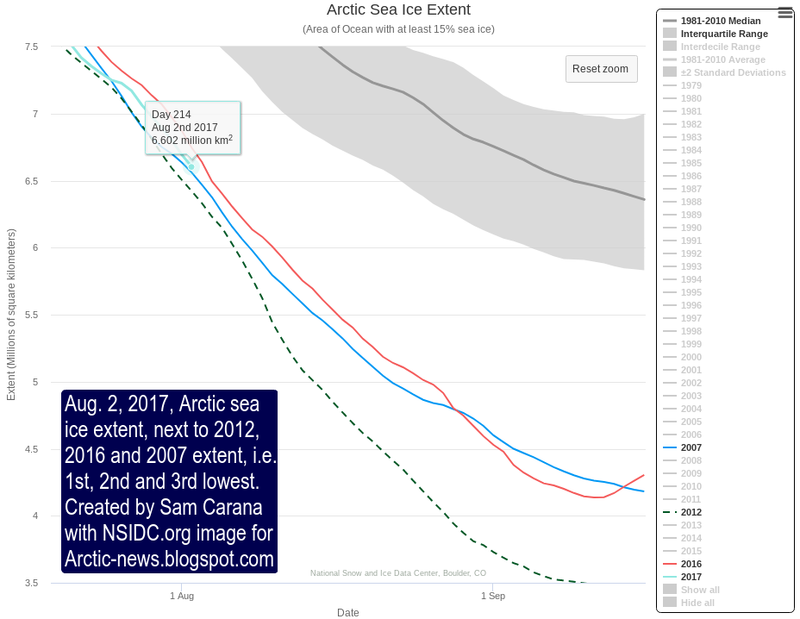 Arctic sea ice extent in 2017 is shrinking along a path that currently looks similar to the years 2012, 2016 and 2007, when sea ice reached 1st, 2nd and 3rd place, respectively, regarding lowest extent (image right). Arctic sea ice volume has been at record low since the start of 2017 and is currently similar to 2012, as illustrated by the graph below right, by Wipneus (click on images to enlarge them). Arctic sea ice may look to be similar to what it was in 2012, when extent and volume reached lowest since satellite measurements began. However, sea ice thickness has fallen dramatically over the years in the areas where previously was the thickest ice. 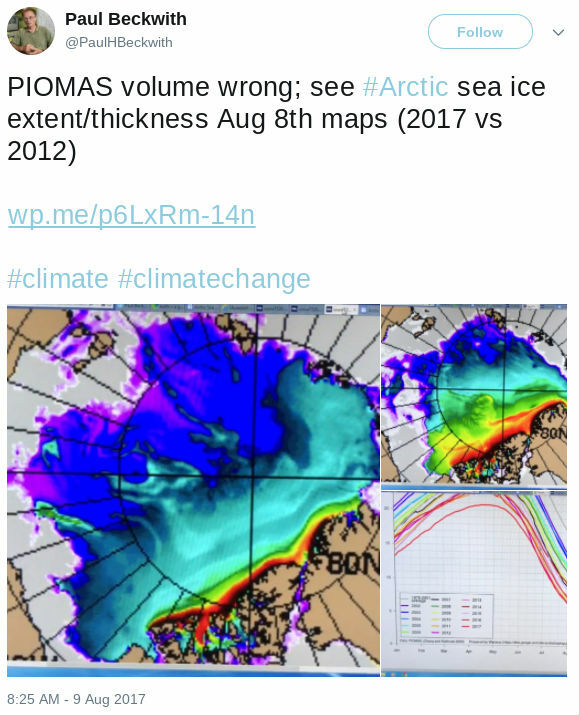 This is illustrated by the combination image below, showing Arctic sea ice thickness (in m) in July 31, 2012 (left panel) versus thickness on July 31, 2017 (right panel). The navy.mil animation on the right shows sea ice getting thinner recently, with especially the thicker sea ice disappearing fast. There appear to be discrepancies between the PIOMASS calculation of ice volume and the ice thickness images by navy.mil. This may be due to the way volume is calculated and may be similar to differences in extent and area. Sea ice clearly has disappeared most where once the thickest ice was present. 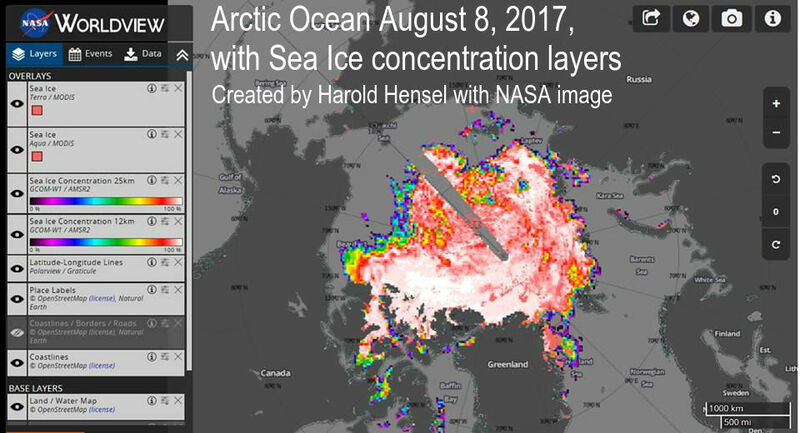 Harold Hensel points out that extent may at first glance show more ice but each cell in a grid may only have 15% of ice present to be labeled 'ice-covered'. Harold adds an image showing ice concentration, which gives another insight in the shape and condition of the sea ice (above image). Paul Beckwith and Patrick McNulty bluntly conclude that PIOMAS is wrong, as illustrated by the Twitter screenshot on the right. 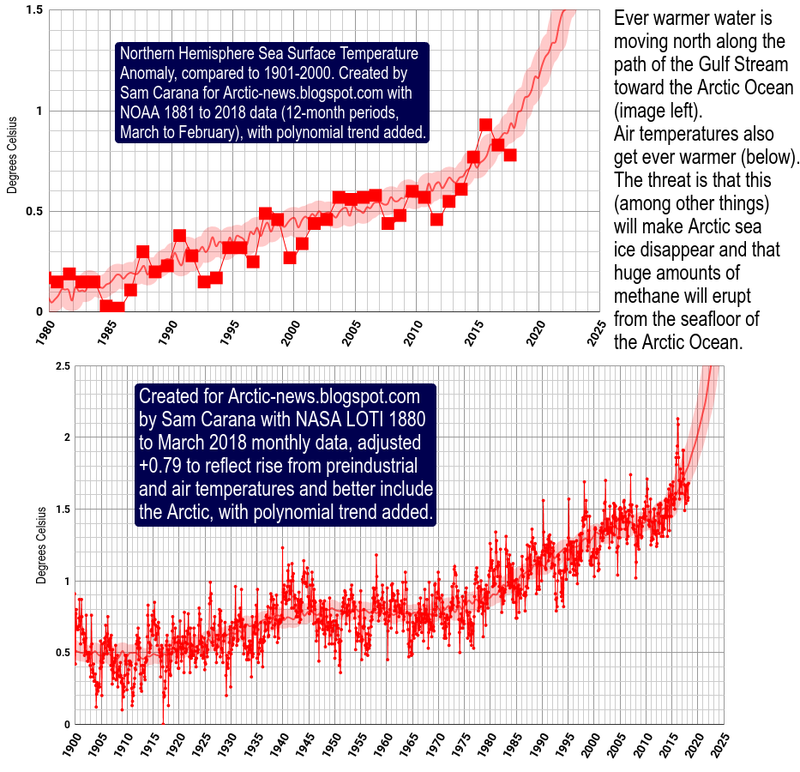 Clearly, dramatic shrinking of the thicker sea ice has occurred over the past few years and one of the reasons for this is the ever warmer water that is getting pushed into the Arctic Ocean along the Gulf Stream. This is melting the sea ice from below. 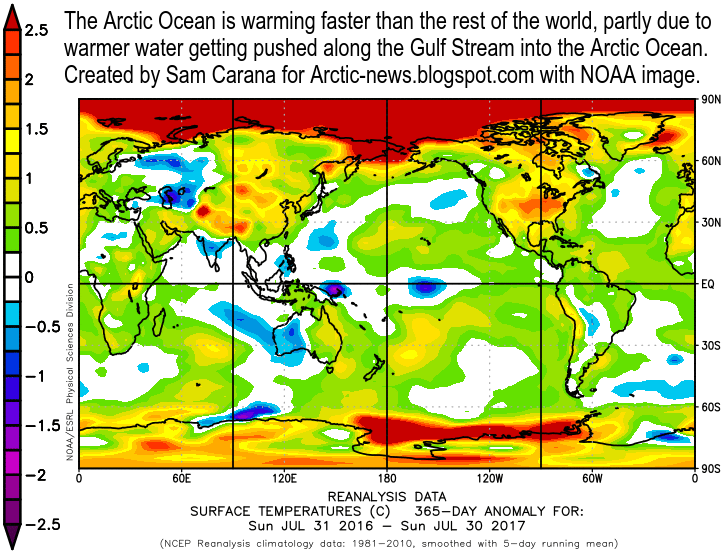 Warming of the Arctic Ocean heats up the air over the Arctic Ocean, as illustrated by the image below. 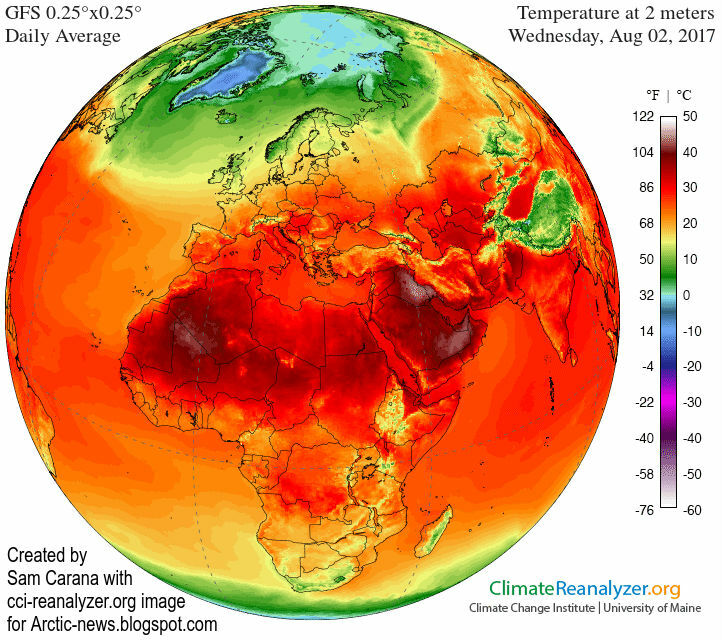 The above image shows a 365-day surface temperature anomaly. The change over time is also illustrated by the animation on the right. On average, surface temperatures over the Arctic Ocean have been more than 2.5°C (or 4.5°F) warmer than in 1981-2010. The warmer air is now also melting the sea ice from above, as temperatures over the Arctic have risen to well above the freezing point. 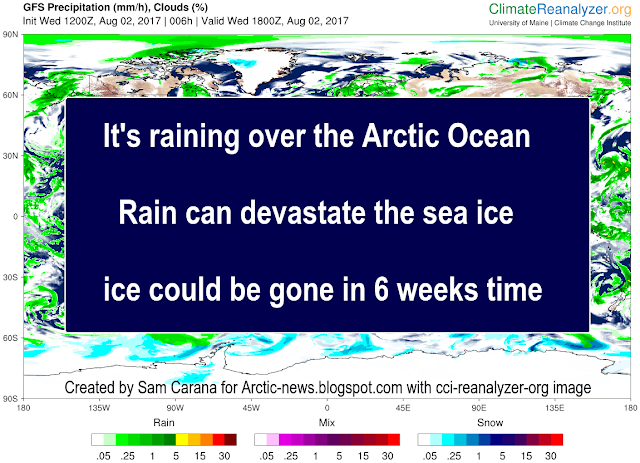 High temperatures over the Arctic Ocean means that precipitation no longer takes the form of snow, but instead falls in the form of rain. Below is a further warning, against a more recent background image (situation on August 6, 2017). High temperatures of the surface of the ocean combined with strong winds makes that a lot of moisture is rising from the sea surface to the atmosphere. The image on the right shows that sea surface temperatures in the Bering Strait were as high as 19°C (or 66.2°F) on July 22, 2017. This is partly the result of warm water from rivers entering the Bering Strait. 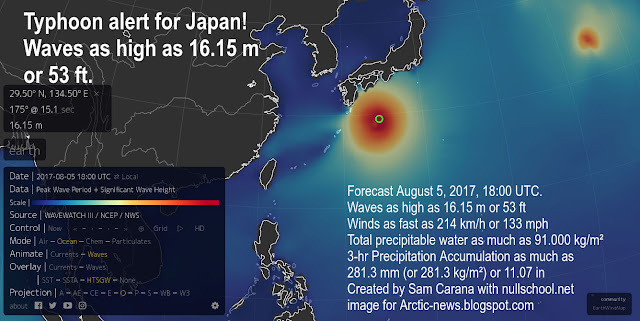 Furthermore, cyclones can make winds reach high speeds, as illustrated by the image below, showing Typhoon Noru approaching Japan. The image shows a forecast for August 5, 2017, 18:00 UTC. Waves have been forecast to be as high as 16.15 m or 53 ft, while winds have been forecast to be as fast as 214 km/h or 133 mph or 116 kn. Total precipitable water has been forecast to be as much as 91.000 kg/m² and 3-hr Precipitation Accumulation has been forecast to be as much as 281.3 mm (or 281.3 kg/m²) or 11.07 in. Back to the Arctic, where strong winds and moist air combine to make a lot of rain, as temperatures are well above freezing in most areas, as illustrated by the image on the right (showing air temperature at 2 m). 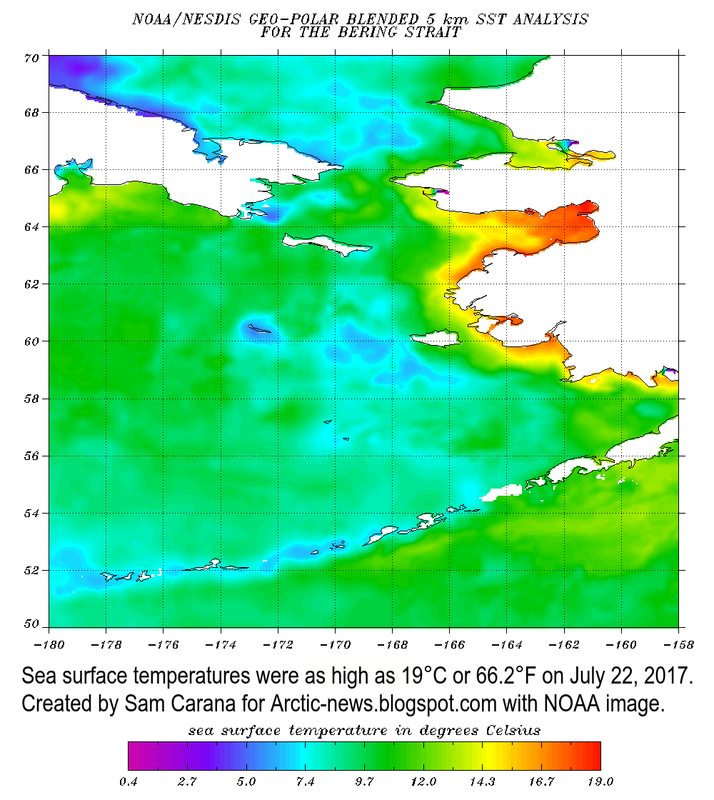 The image below shows how strong winds are pushing warm and moist air through the Bering Strait on July 31, 2017 at surface level (left), at 700 hPa (center) and at 250 hPa (right), where the jet stream used to separate the cold air in the Arctic from the warmer air further south. As above image also shows, the jet stream is getting more and more out of shape, at places crossing the Arctic Ocean. In the video below, Paul Beckwith discusses the situation in the Arctic. 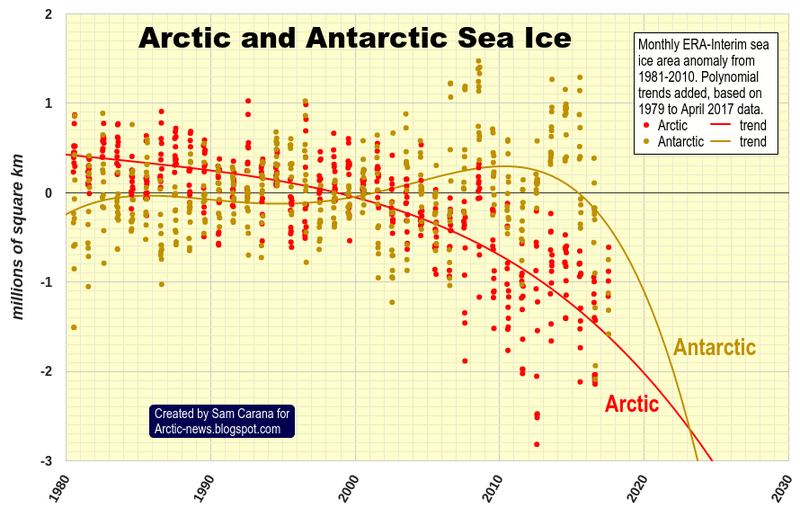 The image below shows trends for both Arctic and Antarctic sea ice area pointing downward. Given the speed at which many feedbacks can kick in and the interaction between warming elements, Arctic sea ice volume may well be gone by September 2017. 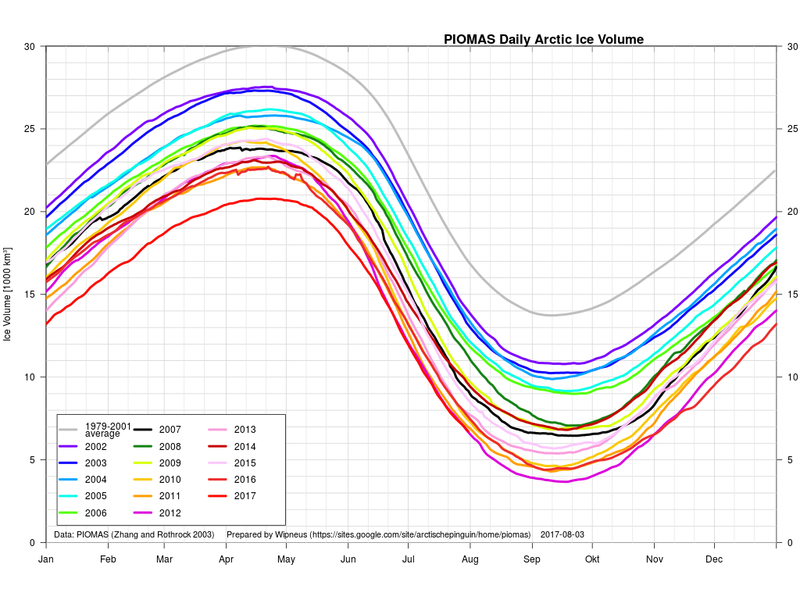 The low sea ice volume means that there is very little sea ice left to act as a buffer this year. Therefore, a huge amount of heat will not be able to be consumed this year in the process of melting ice and will instead speed up warming of water of the Arctic Ocean. 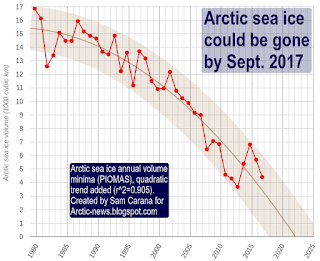 Less sea ice additionally means that less sunlight will be reflected back into space, and this heat will instead further speed up Arctic warming. Where can all this extra heat go? Sea ice is expected to start sealing off much of the surface of the Arctic Ocean by the end of September 2017, which will make it harder for heat to escape the Arctic Ocean by entering the atmosphere. 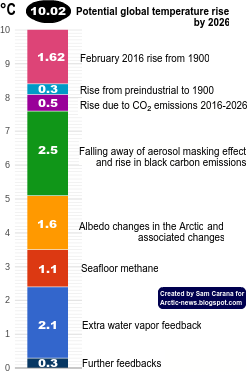 The danger is that much of the extra heat will instead reach sediments at the seafloor of the Arctic Ocean that contain huge amounts of methane in currently still frozen hydrates. The image on the right shows that methane reached levels as high as 2583 ppb on July 31, 2017. 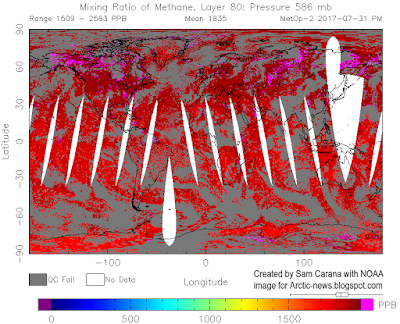 The image also shows high methane levels over Antarctica where hydrate destabilization also appears to be taking place, as discussed in an earlier post. Otherwise it's all gone in the next 8 weeks? 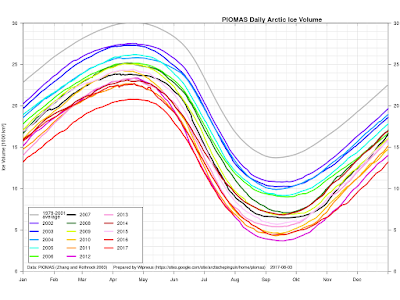 Arctic sea ice could all be gone six weeks from now. I'm still working on further content for this post. 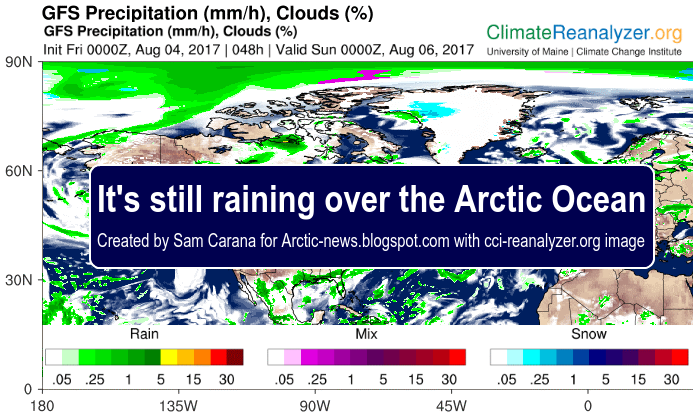 Point is that it's raining over the Arctic Ocean, which can devastate the sea ice. I'll add more on this soon. Either way: with heat not leaving the Arctic Sea over the winter, or no buffer to start with next year---the methane is coming soon in larger and larger quantities. And here in the US, we are all distracted by tweeting. Hang on to your hat ! I keep checking to see if I'm wrong. So far I'm sorry to say every bit of news probes me right. There is much less time left to survive this than originally anticipated. Add tensions with North Korea and the Great 'rotten' Pumpkin. All this winning. Smh. 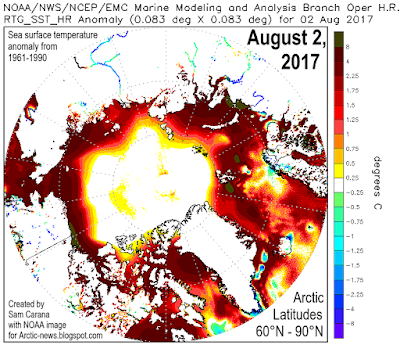 "While sea ice extent may look similar to these other three years, sea ice thickness has fallen dramatically over the years, as illustrated by the image below, showing Arctic sea ice thickness (in m) in July 31, 2012 (left) versus thickness on July 31, 2017 (right)." The HYCOM map appears to show about the same amount of first year (1 meter) ice but much more multi year (2+ meter) ice in 2012, implying significantly more volume in 2012. To me this means average arctic sea ice thickness cannot be "dramatically" different between August 2012 and August 2017, since it can only be 5% different. Does the HYCOM map make it look more different than it actually is? There may appear to be discrepancies between the PIOMASS calculation of ice volume and the HYCOM ice thickness images by navy.mil, but that's no reason to doubt the accuracy of the HYCOM images. As I pointed out, dramatic shrinking of the thicker sea ice has occurred over the past few years. I've meanwhile also added images by Harold Hensel and Paul Beckwith, which may shed further light on this. Indeed, apparent discrepancies may be due to the way volume is calculated and I look forward to some further discussion on this.